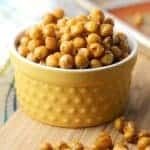 HONEY ROASTED CHICKPEAS are a quick and easy snack choice for kids and adults alike! Salty, sweet, crunchy, and totally addictive! Preheat oven to 375 degrees F. Line large baking sheet with silpat or parchment paper. Spread chickpeas on the baking sheet, making sure not to over-crowd. Bake in oven for 45 - 50 minutes or until crunchy. In med bowl, combine the olive oil, honey, cinnamon and salt. Put hot chickpeas into the mixture an stir to coat. Spread back onto prepared baking sheet. Return to oven for 10 minutes, to allow honey mixture to caramelize. Remove from oven and cool before eating.